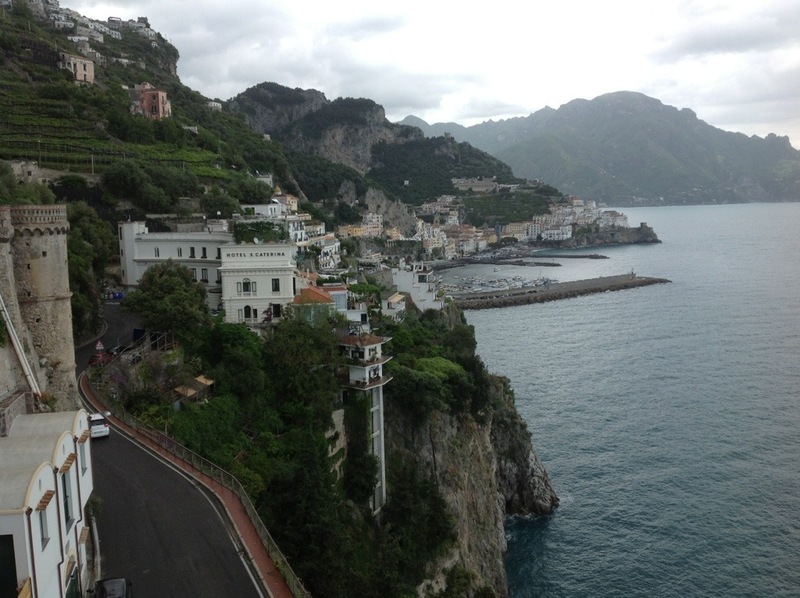 Welcome to Amalfi, Italy. Gail and I have come here with Kate and Brad and granddaughters Demi and Chloe for eleven days of fun and sun. Or fun, at least, since it isn’t sunny. Yet. I have the faith those clouds will leave us soon. Faith and the weather report. Getting here was easy, at least the first 8000 miles. It’s always the last little bit that gets you. We flew from San Francisco to Chicago to Rome. Got our rental car and braved the Italian highways. I haven’t driven a stick shift since the last time I rented a car in Italy, six years ago. The family was told they could not laugh at me for at least 24 hours. But laugh they did, when I could not figure out how to start the car. It is a BMW wagon with a diesel engine. Turns out you have to hold down both the clutch and the brakes before it will start. At home, driving is easy. Here, it is work to try to read the roadsigns, notice that there is no speed limit, and observe that people take the lane markings as mere suggestions. The final 20 miles of the trip is on the coast road, which is perhaps one and a half lanes wide. This doesn’t seem to slow traffic very much, even though there is a constant dance of vehicles in too-tight spaces. We got to the house we had rented over the Internet, and were appalled It was ghastly, small, tacky, and a very long way from the city. Deciding that the place just wasn’t acceptable, Kate got online and found somewhere much nicer and closer to civilization. Since it was a last minute rental, she haggled on the price, then we went to see it, planning on working on the price some more. We left our luggage in the first house because you can’t haggle very well if you look like you have no options. The new house is stunning. Kate and Brad looked at it while the rest of us enjoyed a cocktail in the hotel across the street. They brought the realtor back and we sat and talked and charmed each other until it was time to try to beat him out of another 10%. The thing I hate about about negotiating is that you never know if you really got the most you could have. How much money did I leave on the table because I didn’t ask for enough? I’ll never know, of course, but I think we got a good price and certainly made him come down from his original offer. In any case, we are very happy. This apartment is lovely and just a short walk into town. Now it’s time for me to go explore. Stay tuned for the rest of the adventure.